Samsung Galaxy Tab has been a revolution and the only true contender to give a fight to Apple ipad . 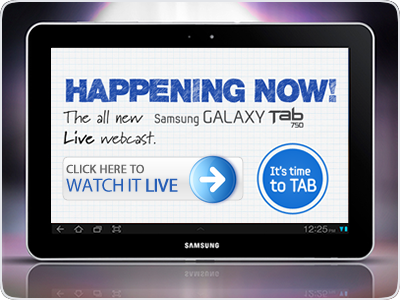 With launch of Tab 750, Samsung has reaffirmed that it is ready to take on the mighty Apple. It would be second tablet from Samsung and is bigger and better. The largest of the company's tablets offers more screen estate and larger battery, while at the same time maintaining the impressively slim waistline. There’s a Tegra 2 chipset ticking under the hood so you get the latest and greatest in mobile chipset technology. And now after receiving accolades all over the world for its slim design and awesome handling, it comes to India. Come the 10th of August, Samsung would officially launch the Samsung Galaxy Tab 750 in Banglore with the usual fan fare. Don't worry if you cannot attend it, you can surely enjoy the webcast right here from the JammySpeaks. The Samsung Galaxy Tab 750 is certainly in the running for the best Android tablet of the year. Slim and sleek, it has a screen that is hard to match in quality by anything of comparable size and this tablet also has plenty of power under the hood. Don't forget to tune into the webcast live from Bangalore on 10th Ugust, 12pm - 2pm on JammySpeaks. Amazing tab. Love to get one.